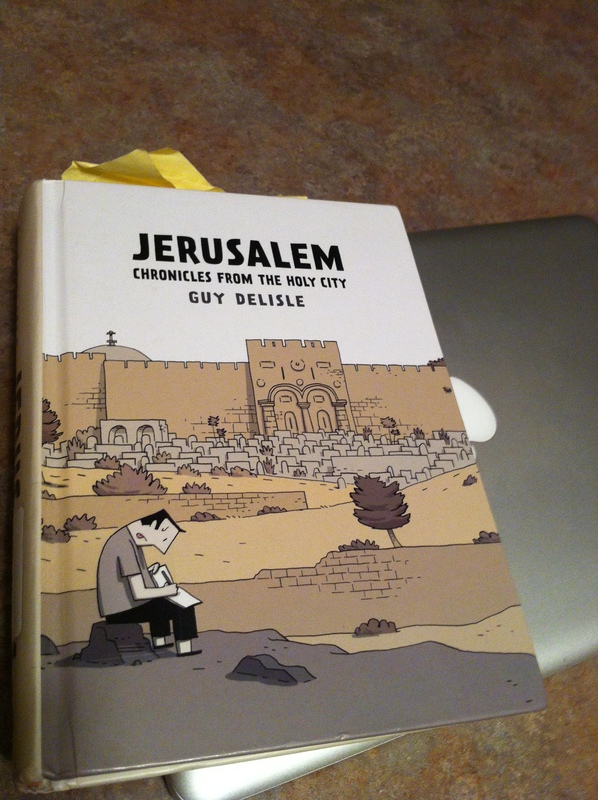 This entry was posted in Uncategorized and tagged Augusta Victoria, cartoon, graphic novel, Guy Delisle, Jerusalem, Jerusalem: Chronicles from the Holy City, Lutheran, Palestine, Quill & Quire, West Bank by somethinggrand. Bookmark the permalink. Thanks Matt… what do you make of graphic novels as a genre? I’ve only read through one… it was different. Hi Allen, this is the first graphic novel I’ve read. I like the form. One thing that you can do with the sketches is to leave pregnant pauses for the reader to “get the point”, something Delisle does very well. And it combines the power of word and image (sometimes caricature) in such powerful ways. I’m not sure if I would like all examples of the genre, but it seemed well suited (and was a surprise to me) about such a difficult subject – partly by “showing” not “telling”. Yes, I could see that with this subject matter. I’ll revisit this at some point. The one I read also dealt with some dark matter, and I’m not sure if my reaction reflected form or content or both.